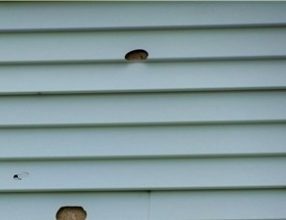 First, locate the damaged piece(s) of vinyl siding that you want to replace. Next, start at one end of the damaged siding piece and slide your zip tool along the bottom edge of the piece. Once you feel the tool hook, pull the tool down and out to unhook the damaged piece from the piece below it. Continue to slide the zip tool along the edge until the entire piece is freed. After that, slide your flat bar behind the vinyl siding. Use the flat bar to pry up the siding and remove the nails. Slide your new siding piece up into the open area and push up on it until the lower lip locks in with the piece of vinyl siding below it. Use your zip tool to grab and move the upper piece of vinyl siding over the new piece and lock it into place.